Alternative items try: Paying £13 for an appearance change! How long does the appearance swap last? Can it be used on other players, and if so, can it be used on out of combat players in cities, and vice versa, can it be used in combat and on members of the opposite faction? Can it be used on npc's such as city bosses? I'm glad they put the Void Shift Glyph in the game in some form, even if it's a consumable with charges. I loved that thing. Just bought this, here are a few facts. The item has 50 charges. Can be used only on party and raid members, does not work on pets. It can be cast in combat, its a 2 second channel which lasts 5 minutes with no cooldown on the item. It doesn't actually "swap" appearances you just look exactly like the player you cast it on. It works on things like shapeshifted druids so yes you can be a cat. Cannot mount while shapeshifted. The buff lasts five minutes and can be removed if you dislike the swap. It doesn't appear to be usable on NPCs or opposite faction players. It does swap appearances, though I don't have experience using it on a shape-shifted player to say if it works in that instance as a swap or not. When I applied it to a party member who was mounted, it transformed me but not the mounted player. Despite being applicable to mount-ready models, you can't mount up with the buff applied. Also, it doesn't swap weapons, which is really unfortunate since I tend to run with a rogue and I personally carry a staff, so I'm left in ugly nightslayer transmogrification gear and my giant staff, which kind of ruins the illusion. i can confirm synnergy with ancient blossom, metamorphosis from warlock, moonfang transformation, millhouse manastorm transformation,tree assasination guise, and leyara's locket. Even more synnergy can be obtained with levitate and lock metamorphosis. Using the prism again will make u swap whatever u look like, this will increase duration for example make ancient blossom trasnformation last longer. can be used on shapeshifted druids: you will gain their appearence, but they WONT change with you. in feral form with Chamaleon glyph, they will change colours. Used this to turn the entire raid into bears. I've tried with this almost all the class-based shape shift forms, and in every single case, it works. This includes otherwise temporary forms, like Inkarnation: Baum des Lebens. You will retain the form even if the target leaves the shape shift or their shape shift spell expires. Only form I haven't tried with by memory is a Druid's Flight Form. Mainhand and Offhand weapons are preserved during the exchange, however the appearance of all armour is swapped. When used on shapeshifted players, they will not take your appearance. They will still gain the buff however, meaning when they hop out of shapeshift they will then appear like you. This is completely combat friendly. You can tank raid bosses as a Treant or cat, or any other form you can think of. You can also recast in combat. However, since this is a channel, I don't recommend it for tanking, as you can't block/dodge/parry while channelling. This is best used with the Toy Box. For example, put down a Kohlenpfanne der tanzenden Flammen and get someone to dance with it, which turns them into a fire-Draenei. You can then use the Prism on them and become a Fire Draenei. Experiment with your friends toy box and you will never get bored! Some models will have weapon and off-hand attachment points, allowing you to wield weapons even though those models traditionally don't allow weapons and off-hands (For example, you can tank with a sword + board as a Treant). Other models have the attachment points incorrectly added - Sometimes when I took cat form (Or travel form?) I ended up being impaled by my own shield. Other forms hide weapons and off-hands entirely. Some combinations of shapeshifts and toys can make you take their normal (unshapeshifted) appearance, but naked, even if they are not. I can't remember how I pulled that one off. Reply if you can reproduce this! You can strip naked yourself, then swap appearance, and they'll be stuck as a naked you until they cancel the buff. You can make a Demonology Warlock cry by stealing his appearance in while tanking, and actually be a Demon Tank for 5 minutes. Glyphe 'Verkleiden' + Reflektierendes Prisma Work! Anyone use this in PvP? Imagine a foe's surprise after they gank a tank's party priest and it's the tank!. Of course the two-hander would be a dead giveaway, but I've seen my share of stupidity on battlegrounds. If a druid has this glythed Glyphe 'Sterne' and swap appearance. 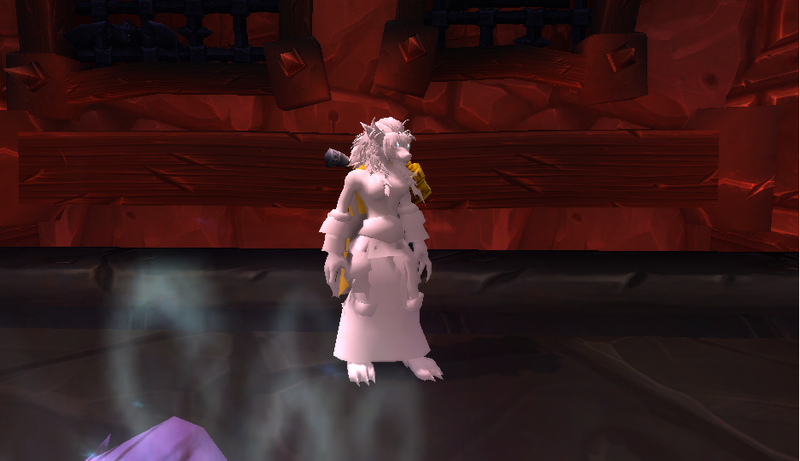 You will look like a worgen female in just white-out form. No color. if you are worgen and use it on a worgen, and change to human, the skin texture stays the same (fur, not skin lol) and the head gear gets tottaly weird! using it on a worgen with stormwind set from dwarven bunker makes my worgen (on human form) stay with no helmet but the helmet texture stays! Incorporate this into a macro and keybind/click it if you have some more enthusiastic raiders love making you into a bear, cat, wolf, or other such transformation to make you lose track of your character during times of high raid movement. You can now mount while under the effect of Reflektierendes Prisma. Mounting while not disguised as something with a mounted animation will cause the player to turn into their player model. Step 1: Find a mage with a variety of Polymorph alternatives such as monkies, penguins, rabbits, pigs, turtles etc. Also find one more willing volunteer. Both must be level 90 or higher. Step 4: Reflecting Prism your volunteer, have him click off the Reflecting Prism buff, Use the Reflecting Prism again. Both should now have the polymorphed form from Prism buff. I put off learning this on my JC until recently, because the vendor tooltip on the recipe says "1 charge" and I didn't see any point in using a Sorcerous Fire on a consumable item with only one charge. This item is a total blast when combined with Magischer Haustierspiegel. The mirror illusion breaks on spellcasting or damage, but the Prism doesn't. This means you can do your raid or timewalking dungeon as the Firelord himself, a pack of Glutkätzchens, or some other menagerie of pets. Götze des Anubisath - Equips the weapons you have on your character and uses them, including dual wielding. Infernals like Netherraumabyssal and Höllchen - If you combine this with Trinkhorn der Vrykul, you get pretty big. I'll update this as I find more that are really fun. I take your faces, for the glory of the many-faced god! Cannot be used to copy a worgen's human form on a non-worgen. The other character is put in worgen form, regardless of who used the prism. With two worgen, they copy both of each other's forms (human and worgen) and can switch between them independently using Two Forms, but the human form is currently texture-bugged, as reported by fathom81. Coolest way to use this item I've found so far is to cast it onto someone who has just clicked on the teleporter in Hellfire Citadel, to turn into an orb of magic. Really hard to pull off, but it looks amazing. Screenshot Proof. Kinda sounds the same doesnt it? Step 1: Enter a dungeon with a druid tank. For maximum effect, use the most humanoid-looking race you possibly can. Step 2: During combat, use the prism on the tank. Step 3: Watch and laugh. This seems to no longer work with the magic pet mirror toy. :( So much for that. I have no idea what combination of appearance swaps had to be done to make this happen, but about 10 people were just walking around Dalaran with the reflecting prism buff ... as 4-story-high ghost devilsaurs. I need to know how to do this. Benutzen: Tauscht das Aussehen mit einem Gruppenmitglied.